Sailing on English Bay is an exhilarating experience, with mountains to the north, the Vancouver skyline to the east, The Georgia Strait and Vancouver Island to the West. Experienced sailors will love the great winds and vast territory to sail. New sailors can learn how to sail through our CANSail certified dinghy sailing programs. Our lessons and refresher clinics are designed to give you the resources and knowledge you need to make smart and safe decisions on the water. Individual fleet access is granted based on proven skill level, and only once a member has completed the orientations and fleet-specific rigging and capsize clinics. More information on sailing skills, progression and checkouts. Please check the volunteer page to see how you can help us run the club! We have built up an incredible fleet of fast, fun, and seaworthy sail boats. Our range of vessels ensures a suitable boat for all skill levels, from beginners to advanced sailors. Lasers (5): If you love to sail single-handed, then this is the perfect boat for you. Easy to sail and to rig. We also have the smaller Radial sails for sailing in stronger winds. The fleet consists of five Race Rigged Lasers all ready for your participation in the Jericho racing series held on Tuesday nights and Sunday afternoons. Vanguard 15s (3): The Vanguard 15 is a two person monohull sailboat. In fact, the V-15 is lighter, tougher and more fun than any other boat in its class. The V-15 delivers speed in a straight forward, durable, lightweight package for sailors of all skill levels. Tasars (4): The Tasar is a 4.5 m high performance sailing dinghy, designed to be sailed and raced by a man and a women. A light weight, low drag, planing hull, a rotating mast, and a jib and fully battened mainsail with efficient sail controls provide exhilarating sailing without the need for spinnaker or trapeze. Tasar racing is extremely popular and competitive at Jericho, and we have 4 solid, race ready Tasars in our fleet. 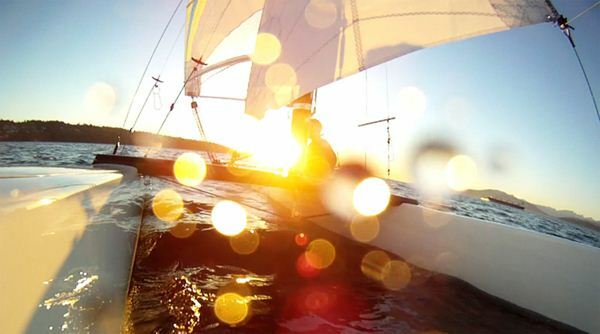 RS500 (1): One of our newer boats, the RS500 includes a Spinnaker and single trapeze for the crew. For members who want the challenge and thrill of zooming downwind on a mono-hull, look no further! Nacra recreational and performance catamarans - We have six Nacra cats, three of which are categorized as recreational boats, and a further three with spinnakers and lots of power for racing. Nacra 500s (2):If you love sailing Catamarans, you will enjoy the ease and safe handling of the Nacra 500. Fun, safe and easy to sail for members that have taken lessons on the Vanguards or Lasers.The 500 is also a dream to single hand once you advance your skills and includes dual trapeze. Great downhaul control for heavy air days and higher performance. Adjustable trapeze for skipper and crew make this boat a pleasure to sail, but don't be fooled, all Club Locarno catamaraT ns are high performance machines! Nacra 570 (1):If you are confident and comfortable sailing the Nacra 500, then you may want to apply your sailing skills to the Nacra 570. This boat simply has more power and speed than the Nacra 500; a longer hull length and greater buoyancy make this an ideal boat for multiple sailors and larger crews. Adjustable trapeze for skipper and crew make this boat a pleasure to sail! 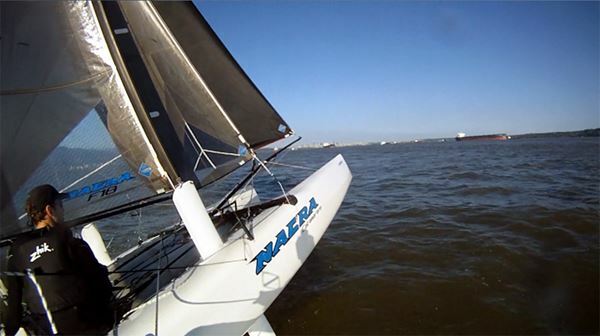 Nacra 580 (1):This sport catamaran is the ultimate hybrid between a racing and recreational catamaran. With it’s kick up centerboards and volumed hulls, it is high speed performance and fun guaranteed. It is also equipped with an asymmetrical spinnaker kit for even more downwind performance. Longer with a slightly larger sail plan than an F18, it has a similar performance rating and is an incredibly fun boat to sail! 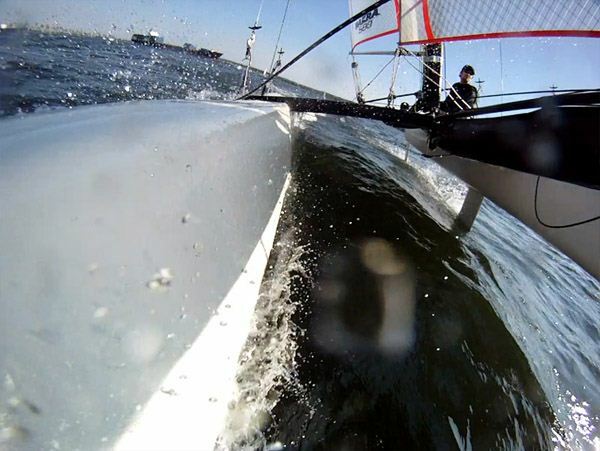 Nacra F18 (1):Designed to the Formula 18 Rule, the Nacra F18 is a production boat in a development class. Its wave-piercing hulls are canted outboard 4 degrees, and flatter sections aft are designed to promote planing. The hulls are built with infusion technology, making them stiffer and lighter than those built using conventional layup process. The rig setup features a wing mast with a fat-head main, a self-tacking jib, and a high-aspect asymmetric spinnaker. The Nacra F18's thin yet buoyant hulls still outpoint and out race newer planing hull designs in light air. 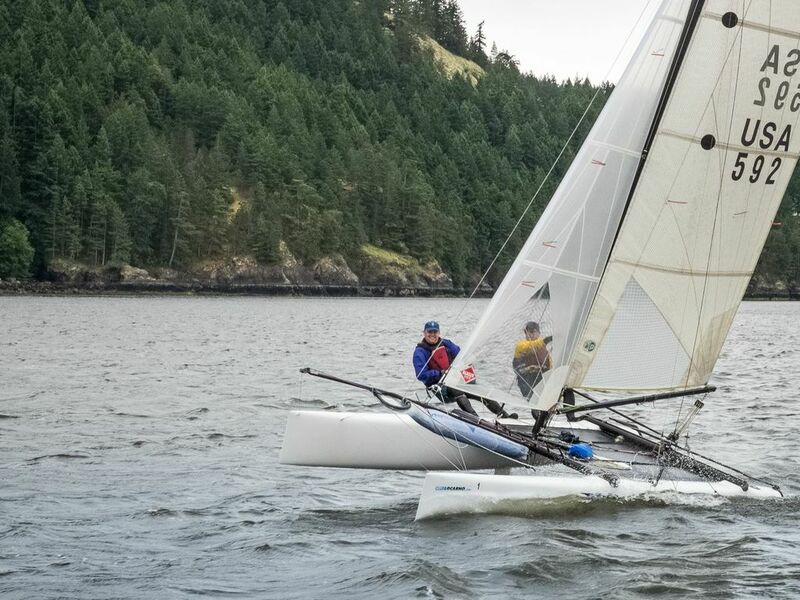 A brand new jib (infusion cut), new dousing bag, inboard hiking straps and near new second racing spinnaker for 2014 give Club Locarno two competitive boats on the racing line in the F18 fleet or for a blast around English bay for fun. Want to sail 20+ knots downwind? This boat is for you! 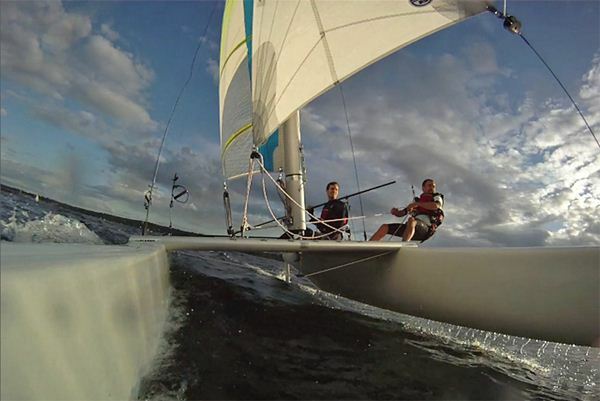 Nacra F18 Infusion (1): The infusion introduced a new hull design that remains one of the best in the F18 class in 2014. Wave-piercing hulls are canted outboard 4 degrees, and flatter sections aft are designed to promote planing. The hulls are built with infusion technology, making them stiffer and lighter than those built using conventional layup process. The rig setup features a wing mast with a fat-head main, a self-tacking jib, and a high-aspect asymmetric spinnaker. Race rigged and tuned with a continuous spi sheet with low friction tail, extra long adjustable trapeze with disk handles and shock block continuous tension, on the water jib clew adjustment hook, tack tensioned spi halyard, port board uphauler, 10:1 mainsheet blocks and many more racing niceties.